The museum's origins date to 1968 when Gordon Bell began a quest for a historical collection and, at that same time, others were looking to preserve the Whirlwind computer. The resulting Museum Project had its first exhibit in 1975, located in a converted coat closet in a DEC lobby. In 1978, the museum, now The Digital Computer Museum (TDCM), moved to a larger DEC lobby in Marlborough, Massachusetts. Maurice Wilkes presented the first lecture at TDCM in 1979 – the presentation of such lectures has continued to the present time. TDCM incorporated as The Computer Museum (TCM) in 1982. In 1984, TCM moved to Boston, locating on Museum Wharf. In 1996/1997, The TCM History Center (TCMHC) in Silicon Valley was established; a site at Moffett Field was provided by NASA (an old building that was previously the Naval Base furniture store) and a large number of artifacts were shipped there from TCM. In 1999, TCMHC incorporated and TCM ceased operation, shipping its remaining artifacts to TCMHC in 2000. The name TCM had been retained by the Boston Museum of Science so, in 2000, the name TCMHC was changed to Computer History Museum (CHM). In 2002, CHM opened its new building (previously occupied by Silicon Graphics), at 1401 N. Shoreline Blvd in Mountain View, California, to the public. The facility was later heavily renovated and underwent a two-year $19 million makeover before reopening in January 2011. The Computer History Museum claims to house the largest and most significant collection of computing artifacts in the world (the Heinz Nixdorf Museum, Paderborn, Germany, has more items on display but a far smaller total collection). This includes many rare or one-of-a-kind objects such as a Cray-1 supercomputer as well as a Cray-2, Cray-3, the Utah teapot, the 1969 Neiman Marcus Kitchen Computer, an Apple I, and an example of the first generation of Google's racks of custom-designed web servers. The collection comprises nearly 90,000 objects, photographs and films, as well as 4,000 feet (1,200 m) of cataloged documentation and several hundred gigabytes of software. The CHM oral history program conducts video interviews around the history of computing and networking, with over 700 as of 2016. The museum's 25,000-square-foot (2,300 m2) exhibit "Revolution: The First 2000 Years of Computing," opened to the public on January 13, 2011. It covers the history of computing in 20 galleries, from the abacus to the Internet. The entire exhibition is also available online. The museum features a Liquid Galaxy in the “Going Places: A History of Silicon Valley” exhibit. The exhibit features 20 preselected locations that visitors can fly to on the Liquid Galaxy. The museum has several additional exhibits, including a restoration of an historic PDP-1 minicomputer, two restored IBM 1401 computers, and an exhibit on the history of autonomous vehicles, from torpedoes to self-driving cars. 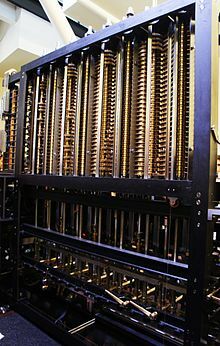 An operating Difference Engine designed by Charles Babbage in the 1840s and constructed by the Science Museum of London was on display until January 31, 2016. It had been on loan since 2008 from its owner, Nathan Myhrvold, a former Microsoft executive. Former media executive John Hollar was appointed CEO of The Computer History Museum in July 2008. In 2010 the museum began with the collection of source code of important software, beginning with Apple's MacPaint 1.3, written in a combination of Assembly and Pascal and available as download for the public. In 2012 the APL programming language followed. In February 2013 Adobe Systems, Inc. donated the Photoshop 1.0.1 source code to the collection. On March 25, 2014 followed Microsoft with the source code donation of SCP MS-DOS 1.25 and a mixture of Altos MS-DOS 2.11 and TeleVideo PC DOS 2.11 as well as Word for Windows 1.1a under their own license. On October 21, 2014, Xerox Alto's source code and other resources followed. The CHM Fellows are exceptional men and women 'whose ideas have changed the world [and] affected nearly every human alive today'. The first fellow was Rear Admiral Grace Hopper in 1987. The fellows program has grown to 80 members as of 2018. ^ "COMPUTER HISTORY MUSEUMS MAJOR NEW EXHIBITION OPENS". Computer History Museum. Archived from the original on January 3, 2017. Retrieved March 5, 2017. ^ Wollan, Malia (2011-01-13). "Computer History Museum Unveils Its Makeover". The New York Times. Archived from the original on 2016-12-04. ^ Bilton, Nick (2010-01-14). "Bits Pics: The Computer History Museum". The New York Times. Archived from the original on 2011-01-19. Retrieved 2011-01-15. ^ "Computer History Museums Major New Exhibition Opens January 12th 2011". Computerhistory.org. Archived from the original on 2011-01-17. Retrieved 2011-01-15. ^ "David Laws' App Shines in New Exhibit at Computer History Museum". BATW. Archived from the original on 2017-01-06. ^ "MacPaint and QuickDraw Source Code". Computer History Museum. July 20, 2010. Archived from the original on August 22, 2012. ^ Hesseldahl, Erik (2010-07-20). "Apple Donates MacPaint Source Code To Computer History Museum". businessweek.com. Archived from the original on 2012-02-09. ^ Shustek, Len (2012-10-10). "The APL Programming Language Source Code". computerhistory.org. Archived from the original on 2013-10-07. Retrieved 2013-10-15. ^ Bishop, Bryan (2013-02-14). "Adobe releases original Photoshop source code for nostalgic developers". theverge.com. Archived from the original on 2014-01-17. Retrieved 2013-10-15. ^ Shustek, Len (2014-03-24). "Microsoft Word for Windows Version 1.1a Source Code". Archived from the original on 2014-03-28. Retrieved 2014-03-29. ^ McJones, Paul (2014-10-21). "Xerox Alto Source Code - The roots of the modern personal computer". Software Gems: The Computer History Museum Historical Source Code Series. Computer History Museum. Archived from the original on 2015-01-02. Retrieved 2015-01-08. With the permission of the Palo Alto Research Center, the Computer History Museum is pleased to make available, for non-commercial use only, snapshots of Alto source code, executables, documentation, font files, and other files from 1975 to 1987. Bell, Gordon (2011). Out of a Closet: The Early Years of the Computer [x]* Museum. Microsoft Technical Report MSR-TR-2011-44. Wikimedia Commons has media related to Computer History Museum.